Ah, the introduction of solid foods or weaning. The questions of when to start and what to start with are very important for many parents, including myself. As with so many things Montessori, there is preparation before the big day arrives. We want to help the child to be psychologically and physically prepared so that the experience of food other than mother’s milk or formula will be a pleasurable one and one that is met with great joy. Also on a practical note, that the transition to solid foods is a smooth one, as it can be a stressful time for many parents. You can read about the Montessori approach here: “How I Weaned Myself” and in numerous Montessori books such as “Understanding the Human Being” and “Raising Your Twins“. A very quick summary (but please read the other sources if you don’t know about this approach! ): 3rd Month introduce fruit juice, 4th Month introduce mashed egg yolk, 5th Month introduce bread. All of this is not for nutritional purposes and the juice and protein are given on a very tiny spoon. It helps the baby to learn that food can come from a spoon (not always the breast or a bottle) and helps to get the digestive enzymes going. The bread is held by the child so he/she can learn the experience of feeding him/herself. It exposes the baby to various types of food so you know the baby doesn’t have an allergy to these foods. I was greatly excited about trying this out with my daughter. 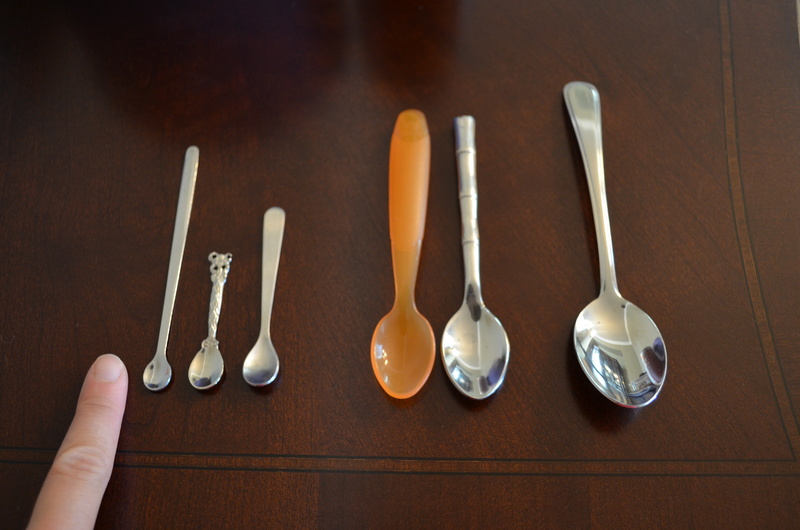 I picked up a few tiny spoons whenever I saw one. These were often sold as “salt spoons.” Ideally it would be silver as silver allows food to be distinctive in taste and doesn’t change temperature but I didn’t find any silver ones. But despite my excitement, everything else I read says not to introduce babies to solid foods, including the Canadian Paediatric Society and the WHO. Doing some internet research there seemed to be many people who disagreed with this Montessori approach to pre-weaning mostly due to this “wait until 6 months” recommendation, the concern of the development of food allergies, and introducing sweet fruit juice. I couldn’t wrap my mind around how such a tiny amount of food would have a long term negative affect upon A.’s intestinal system (does she not ingest this much dog hair?). So at A.’s 4 Month check-up I brought the spoons, explained what I wanted to do, and asked both her medical doctor and naturopathic doctor. Her medical doctor thought it was a great idea, assuring me that the research for development of food allergies was not overwhelmingly strong, and told me to go for it. Her naturopathic doctor encouraged me to wait until at least 5 months and choose vegetables rather than fruit (“our bodies were designed for vegetables” not about the sweetness factor), as well as talking me through the details of intestinal development, ultimately giving me the ok to go ahead with it. This greatly helped put my mind at ease and I decided to go for it! When A. was 4.5 months old, I borrowed my parents juicer (thanks Grandma and Boompa!) and started with organic, locally grown apples (although they are not in season). I sat down in the nursing chair with her to give her the psychological point of reference that this is where she eats. With great excitement I offered her the spoon with apple juice on it and touched it to her lips. I offered her a few spoonfuls and she opened her mouth each time. She did have a bit of tongue thrusting, not knowing what to do with the spoon or the new taste. She didn’t really make a disgusted face, more just pondering the taste. I continued doing it in the nursing chair for a few days. On day #2 I offered the spoon to her and she moved her head forward to accept the spoon with juice. On day #3 she reached out her hand, grabbed the spoon, and brought it to her mouth (with me guiding it). I couldn’t believe how “textbook” the experience was! I was super excited by it. Soon my husband or I started offering it to her while we ate dinner at the dinner table while she was in our arms. This was a bit of a fussy time for her and she liked to be held in our arms so was sitting with us at the dinner table anyways. It seemed like a logical thing for us to do as this is where we would be eating dinner together as a family. I hoped it was helping her become accustomed to this new place for eating. For one week we gave her apple juice. Following this we gave her freshly squeezed juice of carrot, bean, and peach, each for at least one week. The peach seemed to be quite sweet for her as she shuddered when she tasted it, but continued to grab the spoon for more. By this time she was 5.5 months and showing many signs of readiness for solid food such as tons of drool demonstrating the emergence of digestive enzymes in the saliva (had been since about 3.5 months), mimicking us chewing food (she had been observing intently for many weeks prior), reaching out for food, and had developed the ability to sit with support. We were traveling at the time but had continued with the vegetable or fruit juices (traveling with our juicer!). 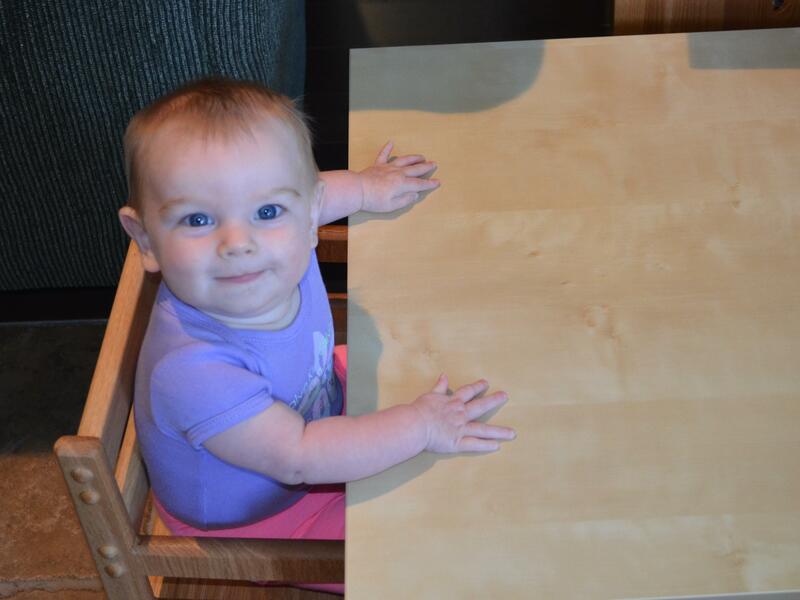 When we returned home we introduced her to sitting in her Tripp Trapp at the dinner table, mostly because it was getting difficult to stop her from reaching for our food. I started giving her mashed fish (sole) with some breast milk on her pre-weaning spoon. I decided to go with fish rather than egg yolk. 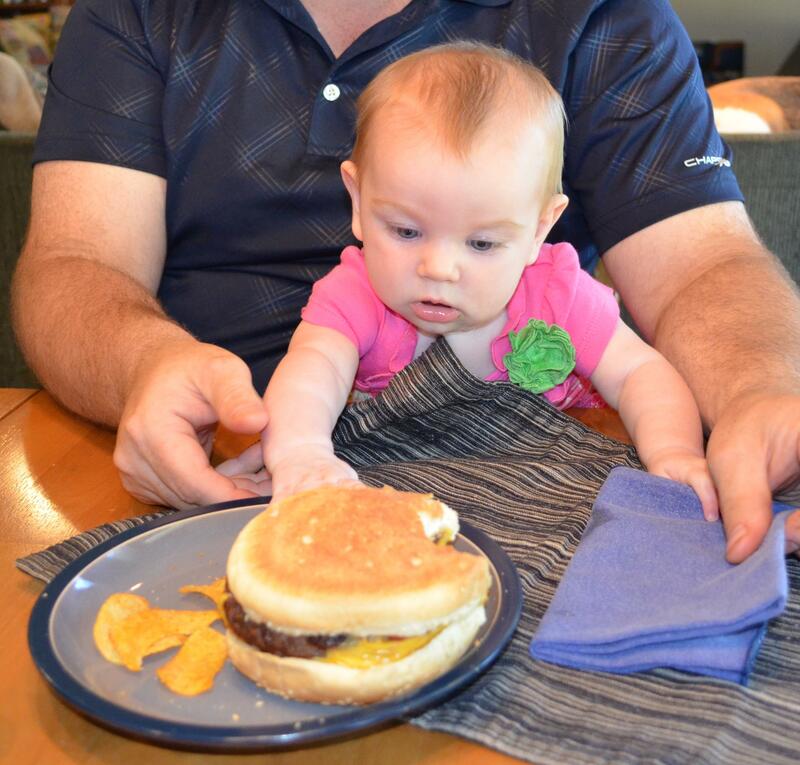 She continued to enjoy the experience of the new taste and now texture. I gave this to her for one week. Thanks for the write up – this is very helpful! I too had issue with offering solids before six months but got the same response from my naturopath so gave it a go. My question is, how often do I give my daughter solids once she is taken to it? N is almost 6 months old,and lately I’ve given her rice cereal cooked in vege broth. Once for lunch, the following day for breakfast. Can I give solids for two meals? I guess I’m wondering what the timetable is, and if it is possible to give them ‘too much too soon’. Any thoughts? Thanks!! Very interesting Carrie. I did everything the traditional way with our kids.I started solids at around 6 months- i forget the exact age- and started with rice cereals etc..They are almost 5 and 3 years old. So great to see there are some new ways of doing things. I did everything as recommened by doctor and what i read as all i knew.